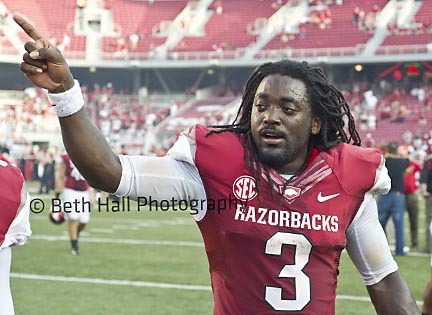 I recently photographed the season opener for the Arkansas Razorbacks football against. Louisiana-Lafayette. I’ve been covering the Hogs for over a decade now, and it seems like the time I start to get into the groove of their system, they change coaches. I almost dreaded going to shoot the game that morning in anticipation of all of the changes. While I love sports, the sidelines at Arkansas are usually congested with a lot of people who aren’t working, and they tend to just get in the way. I will say that I was pleasantly surprised that the University has a new field security system in place, and the sidelines were the best they’ve been in years. Here’s my shout-out to whomever is in charge… THANK YOU!!! While the sidelines are a fun place to watch a game, extra people just make it harder for me to do my job. I’m not going to complain about the people who jump in front of me during key plays, even though it’s frustrating. Just know I’ll tap you on the leg and tell you to move. As my colleagues like to say, I’m not mean I’m just “focused.” My biggest concern with a crowded sideline is safety. If a play is headed my direction, I need to be able to see all the players that are involved, or could be involved. The player that will end up running over me is never the one in the play… it’s the guy coming from a different angle to add that extra push out of bounds. Trust me, I know this from experience and I would like to avoid another embarrassing TV moment again. (there’s a video of that somewhere on this blog). I would also like to avoid the drunk fan that once grabbed my arms and hid behind me, using my body and gear as a shield as the play headed our way. That was not cool…. at all. So here’s to a new season, a new head coach, new rules and hopefully new clear sidelines!